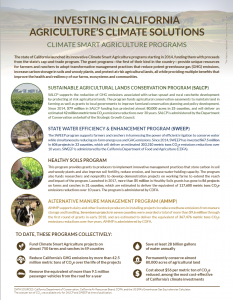 The State of California has four Climate Smart Agriculture programs that provide resources for California farmers and ranchers to reduce greenhouse gas emissions and store carbon in soils and trees, while providing multiple benefits to agriculture and the environment. State Water Efficiency and Enhancement Program (SWEEP) — Since 2014, this popular program has provided financial assistance to farmers and ranchers to harness the power of efficient irrigation, conserving water while simultaneously reducing on-farm energy use and related greenhouse gas emissions. Administered by the California Department of Food and Agriculture (CDFA). Applications accepted until March 8, 2019 for the current round of funding. See the SWEEP application flyer. Sustainable Agricultural Lands Conservation Program (SALCP) — Launched in 2015 as the first program in the country to invest in farmland conservation for its climate benefits, SALCP funds conservation easements on agricultural lands at risk of development as well as grants to local governments to improve farmland conservation planning and policy development. Administered by the Department of Conservation and part of the Strategic Growth Council. Alternative Manure Management Program (AMMP) — Since 2017, AMMP supports dairy and other livestock producers to reduce potent methane emissions from manure storage and handling (e.g., pasture-based dairying, compost production). Importantly, this program incentivizes solutions for methane reduction appropriate for small and mid-scale operations. Administered by CDFA. Applications accepted until April 3, 2019 for the current round of funding. See the AMMP application flyer. Healthy Soils Program — Since 2017, this program incentivizes the adoption of innovative farm practices that store carbon in soil and woody plants and also improve soil fertility, reduce erosion, and increase water-holding capacity. The program also funds researchers and nonprofits to develop demonstration projects on working farms to extend the reach and impact of the program. Administered by CDFA. Applications accepted until March 8, 2019 for the current round of funding. See the Healthy Soils Program application flyer.